Cloud, today, is highly abstracted. Public cloud service providers (CSPs), like AWS, offer a wide array of specialized services like Kinesis, Data Pipeline, Simple Queue Service (SQS), Simple Notification Service (SNS), DynamoDB, ElasticSearch (ES), etc. To top it, the cloud ecosystem in itself is very dynamic — several resources scale up or scale down on demand simultaneously. Monitoring all these resources and getting a holistic view of them is pivotal, however, challenging for a business. That said, traditional IT monitoring solutions that do not support new services and a siloed approach to cloud monitoring do not fit the bill anymore. As a business moves its application(s) in the cloud and its requirements scales up, several dynamics need to be factored in — all revolving around these siloed services. What if someone from another team removes access permission to an S3 bucket without the knowledge of the concerned team, and no one knows why the page stored in that S3 throws 404 error? What if a team’s server instances seem fine on APM tool, but their SQS is building up, and the job processing servers are unaware of it? What if there’s a sudden surge in database queries, as someone from another team changed the security permissions of an ElastiCache cluster, and the concerned team has no clue until the RDS is saturated? In such scenarios, how will an IT team overcome performance issues using just localized logs, static reports, and complex dashboards? The best way forward is to map & analyze the relationship between resources and other configurations contextually, and monitor resources simultaneously. TotalCloud Contextual Monitoring helps monitor AWS resources contextually in a visually-rich color-coded virtual environment. 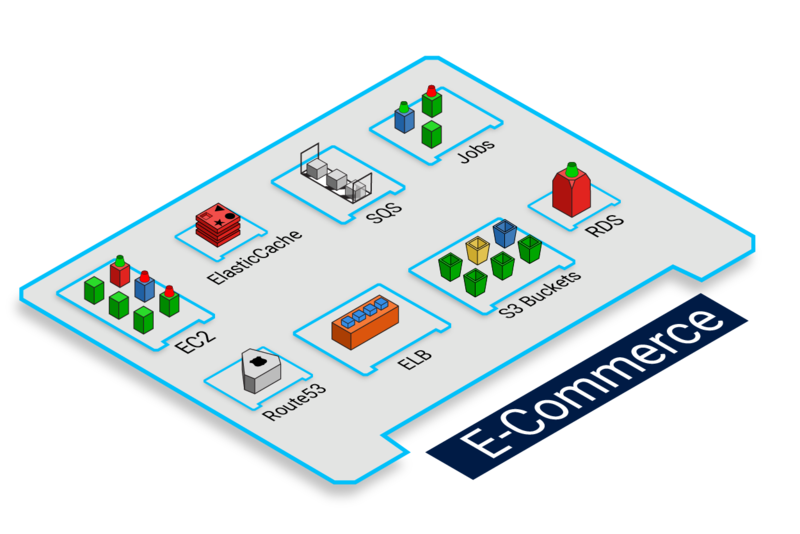 Inside the console, AWS resources are rendered as three-dimensional assets and grouped logically. This logical grouping facilitates for a better understanding of the entire business’ cloud usage. In essence, TotalCloud provides a single pane view of all resources along with relationship views bedecked with smart prescriptive insights. Together, these features eliminate the need for analyzing multiple logs and dashboards, thus empowering an IT team to debug faster and take timely corrective action. With TotalCloud, a team can build the perspective of resources interactively using dynamic grouping — a feature that groups resources according to a type of service, app, tag-label, or tag value or any other attributes. This logical grouping enables a team to visualize resource utilization and get cost insights the way they need it. Additionally, the team can decipher the health status of all resources residing in a region at a top level or granular level with immersive zoom in, zoom out feature. The below diagram depicts how TotalCloud dynamically groups all the AWS services of the web app, by app-view, and provides a holistic view of all services. Using multiple dashboards to map the relationship between instances and its supporting services is vexing. Moreover, tracking and analyzing scores of logs every day, even with the help of monitoring tools, causes fatigue. With TotalCloud, it is not. 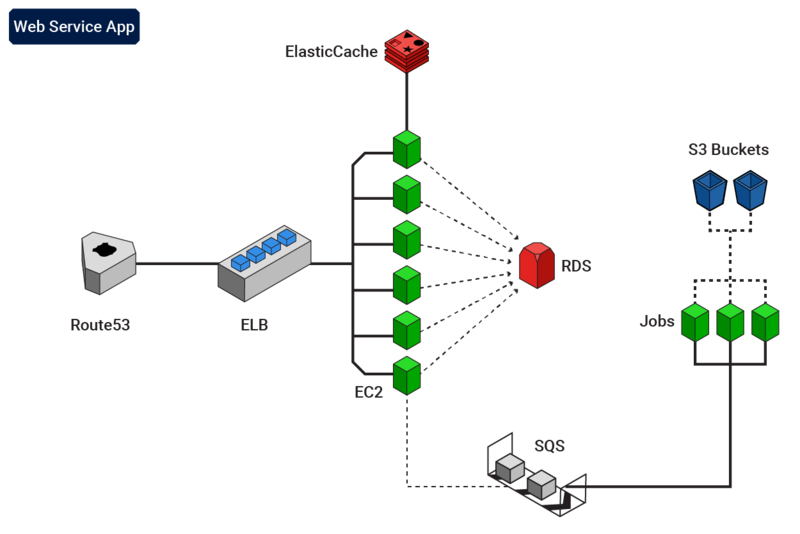 Because, TotalCloud renders the live topology and relationship between resources right from ELBs to EC2s, EBS to RDS, AppELB to target groups, etc., all in color-codes, with just a click on any resource. 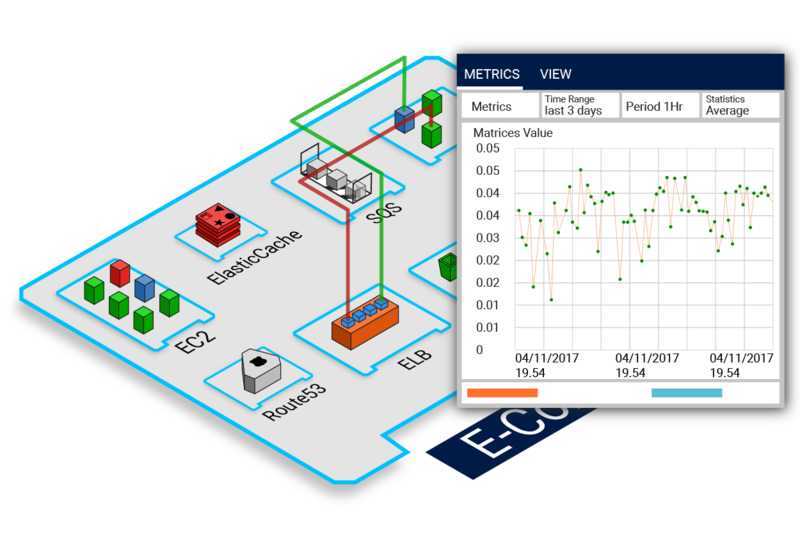 This helps teams to correlate a resource’ utilization status as well as the complete application’s resource utilization status across several metrics, in a glance. The below diagram depicts how TotalCloud maps resource relationship between resources of the Web Service app, helps debug faster and enables teams to monitor cloud health in totality. TotalCloud provides prescriptive insights that help take corrective action from the console. This feature empowers a team to take pertinent action on any resource that needs requisite attention, without ever leaving the console. The below diagram depicts the type of actions a user can take on an EC2 instance used to run the Web Service app. Even though TotalCloud provides a complete visualistic overlay of cloud resources, it also provides graphs too that can throw historical data of multiple CloudWatch metrics with the time range, period and statistics custom defined so that you can perform detailed historical analysis of data. The below diagram depicts how you can generate graphs of historical analysis for your Web Service app. TotalCloud features behavioral AI-based Auto CloudWatch Alarms, which keeps track of instances round-the-clock and creates CloudWatch alert configurations automatically. What’s best is, these alarms pop as color-coded beacons so that user can quickly analyze a situation, make sense of the cloud’s status, monitor critical resources and take timely action. 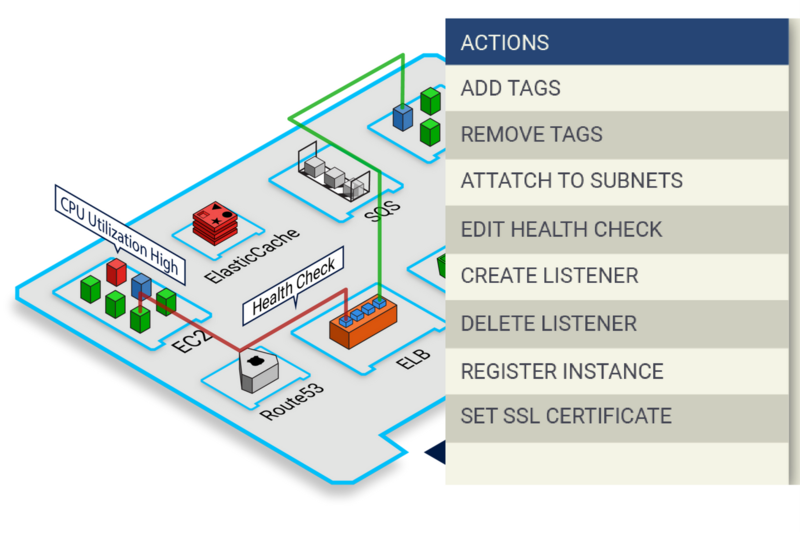 The below diagram depicts Web Service app with Auto CloudWatch Alarms. Siloed cloud monitoring is chaotic, as a business can quickly lose visibility into their cloud usage. Even though CSPs are responsible for monitoring the infrastructure and keeping a business’ services going, the onus of monitoring performance of resources is still on the team. TotalCloud Contextual Monitoring provides a seamless understanding of complete cloud inventory and the applications hosted on top of it in a single view, thus expediting cloud monitoring tasks that took hours to resolve. More so, the real-time cloud-inventory view, overlaid with prescriptive insights, along with the capability to take right actions at the right time, ensures that a business’ apps are always up and running. Are you one of those DevOps or Ops from IT team trying to figure out how to accelerate your IT operations and debug faster on cloud? If you are, you need to try out TotalCloud Contextual Analyzer. You can also virtually view cloud cost spillage in real-time and take corrective action from the same console. Take a free trial today and check it out for yourself.